Love Japanese food just like us? 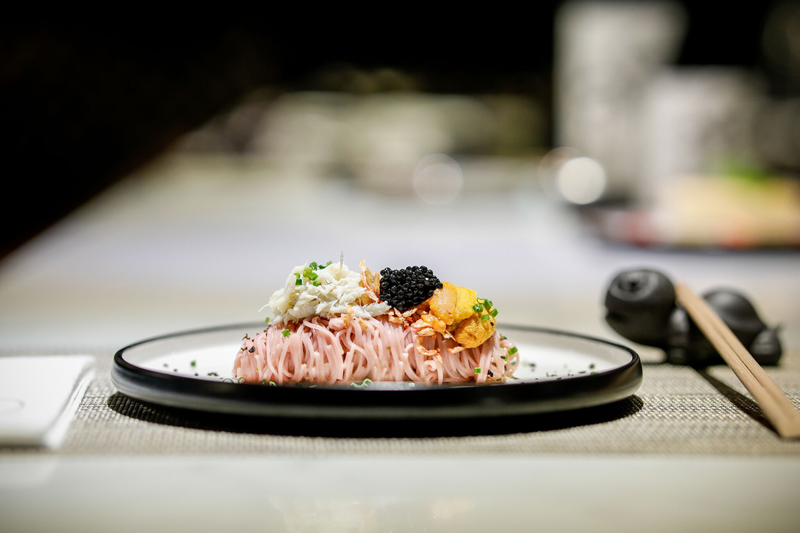 GAKE is one of the rare Japanese restaurants in Singapore that infuses local flavours into Japanese dishes. If Charcoal Karaage and Truffle Hiyashi Somen interest you, perhaps you would like to visit this place. Located along Clarke Quay, get away from the crowd and spend a quiet evening here in a cosy and intimate setting with black, grey hues and wooden furnishings. What better way to end your workday than securing a spot at this hippy Japanese eatery in CHIJMES? Chow down crispy Japanese fried chicken while chugging down a bottle of craft beer. The chicken is marinated with yoghurt and Japanese spices, breaded, and deep-fried to golden brown. Dip them into your choice of sauce: Kare Curry, Wasabi Cream, Tangy Miso, Chill Chilli, Basil Mayo, or Umami Ume. Feel that it’s not sinful enough? Order the Otaku Seafood Waffle or Japanese Fisherman Basket to share. The newest all-day breakfast place has opened along Mohammad Sultan road. The rustic interior with tartan flooring gives off a pretty chill vibe, perfect for hanging out with your buddies. They offer homemade plates of pasta, freshly baked pastries, and organic wines imported from Italy. For an unpretentious homey brunch, you know where to head to now. This one Michelin-starred restaurant boasts a beautifully curated menu of modern European plates that are out of this world. Dive into the Ceps Tartelette and Eggplant Caviar, Foie Gras Symphony on a Delicate Jelly, and more interesting dishes. In terms of presentation, the exquisite details and plating are a 10 out of 10. Pair your meal with wines from all over the world. You’re for a night of refined dining. Located in XY Hotel where the arts meet tech, you know this semi-fine dining restaurant isn’t playing games with their offerings. The representative chef, The Halal Chef innovates local cuisines and gives it a refreshing taste. The Beef Rendang Steak, Bed of Laksa, and Bergedil Mashed Potato are some dishes you can try. They taste good as they look! Located stone throw away from Pasir Panjang MRT, this casual bistro has recently opened in early November. They serve up modern zi char dishes with customisable salads in a bento box. Pick either the Western fusion meal prep or Chinese fusion “wok hei” bento and order four of your desired dishes, all at an affordable price. Dine in a cool, modern industrial setting with your friends and family. This Japanese eatery may probably be your new go-to spot to fulfill your teppanyaki cravings! Prepared right before your eyes by the chef are the Grilled Avocado and Wagyu Minced Katsu that taste heavenly. Besides the teppanyaki dishes, there are also shabu-shabu and sukiyaki to warm your bellies on a cool rainy day. Here you are promised excellent quality ingredients, traditional cooking style, and reasonable prices. Fans of after-work hangouts rejoice! Here’s a new watering hole to add to your list of go-tos to knock back a few before calling it a day. Finding solace in a 19th-century shophouse, this 30-seater bar is a space that showcases products and cocktails that have been meticulously researched and honed over the past couple of years for a memorable and unique experience of flavours. Fans of bartender Kamil’s cocktails are in for a treat as the drinks here are created through precise techniques and the pairing of unusual and delightful flavours that have become a staple of his style. Dishing out the first flame-torched beef bowls and premium Wagyu sushi in Singapore, it’s easy to see why diners are willing to queue for a spot this tiny eatery. Depending on your preference, choose from the classic regular bowls or the petite ones made for those with a smaller appetite. Put on your fancy hats and go for their Aburi Wagyu Beef, where premium Wagyu beef is sous vide for 24 hours and tossed in beef bone jus, rendering it to a perfect melt-in-your-mouth goodness. When in doubt, one can never go wrong with the Ultimate Beef Sushi Experience, featuring eight pieces of Wagyu beef sushi with a variety of flavour profiles. Jalan Besar welcomes another eatery to its neighbourhood as Easy Noodles Bar sets up shop along Foch Road. This hole in the wall opens its doors during lunch and dishes out Yang Chun Noodles, a simple dish served in chicken broth and a sous-vide egg on the side. Noodle fans will be glad to know that the noodles here are made in-house! However, the restaurant transforms into a bar by nightfall, serving up light bites and sharing plates, making it perfect for catching up with good friends. If you’re feeling a little peckish, the bespoke Revel Bistro & Bar brings to you plenty of delectable international cuisine as well as familiar Singaporean flavours to satisfy local taste buds. With a view like this, it boasts fantastic ambience right in the heart of the city. When night comes around, unwind at The Revel Bar which features an array of artisanal cocktails. Be sure to revel in music from various live bands every Friday and Saturday. Only true Japanophiles would have sussed out this hidden gem at Palais Renaissance. For the uninitiated, Ishinomaki Grill & Sake offers both authentic robatayaki and Japanese fare with premium sake and shochu. You can expect to see the usuals such as udon, sushi rolls, and sashimi, but omakase seems to be one of the more popular selections at this joint. Leave it in the skillful hands of the chef as he whips up a meal that you won’t forget! Despite being located in one of Singapore’s busiest malls, this restaurant is a world away from its hustle and bustle. From the airy skylights to the natural wood furnishings, everything about The Botanic is carefully curated to create a restorative atmosphere for guests. The menu here focuses on fresh, eco-friendly produce and using a mix of Western and traditional Asian techniques to bring out the natural flavours of ingredients. A prime example would be the Sambal Smoked Short Rib, a delicious dish inspired by Indonesian cuisine and cooked smokehouse-style. This dish is spicy, sweet, and melts in the mouth from the first bite. For a sweet treat to finish up, opt for the Mediterranean Baklava. Soft and airy pieces of pastry served with pomegranate and strawberries – this dish is light, simple, and will leave you wanting more long after the last bite.